Forget Baby Einstein. Today's sophisticated, tech-savvy fetus Twitters from the womb! But score another point for both the micro-blogging phenomenon and parents with too much money, who have teamed up in the quest to totally piss me off. Meet Kickbee. 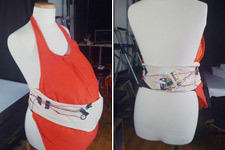 This fashionable, flesh-colored belt, embellished with various wires and microchips, wraps around an expectant mother's pregnant belly. Then, whenever the fetus kicks, the apparatus uses Bluetooth technology to signal a nearby computer that this momentous event has taken place. The computer registers the kick and -- don't ask me how -- automatically posts it on Twitter. So, as Urlesque notes, the blog's subscribers are treated to a barrage of near-identical updates: "I kicked Mommy at 09:14 on Wed, December 10, '08!" That little exclamation point may be the worst part of the whole Kickbee enterprise. Now, instead of waiting to brag that their 10-month-old can speak in full sentences and their 3-year-old is reading "Anna Karenina," yuppie parents can boast of their child's in-utero activity, too! Despite my annoyance, there is one part of this Kickbee business that I do find unintentionally hilarious. What the device actually allows parents-to-be to celebrate is their fetus' violence toward its mother. And come to think of it, if your mother is the kind of lady who buys this sort of crap, perhaps kicking her in the stomach is a noteworthy accomplishment.